But, there is a way to avoid splatters, damaged pans, and a messy kitchen: oven-cooked bacon! Oven-cooked bacon may sound a little odd, or like it will be more time consuming. It may seem like there would be splatters all over the oven. But this is a foolproof method to splatter free, perfect bacon. 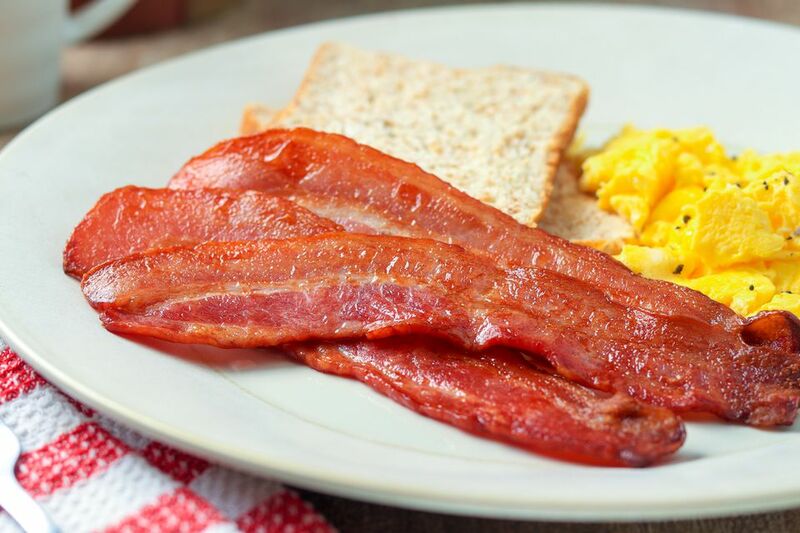 Since the bacon is heated evenly and brought up to temperature on both sides at the same time it allows the bacon to cook completely without any sputters or pops. No mess, no hassle, and minimal cleanup. Oven-cooking also makes it completely flat. This makes it really easy to chop, add to sandwiches and burritos, or to just serve with perfect scrambled eggs and pancakes. Whether you like your bacon extra-crispy or with a little bit of chew left, this is the perfect secret to cooking flawless bacon. Preheat the oven to 400 F. Position the cooking rack in the middle of the oven. There will be little to no splattering as the bacon cooks. Line the jelly roll pan with the tinfoil to catch all of the grease, so you can just lift off the tinfoil and throw it in the trash when you're done. Place a cookie cooling rack on top of the foil lined sheet. Lay out the strips of bacon onto the cooling rack. The strips can touch as they will shrink when cooking. You may have to lay a few pieces of the bacon width-wise as well as length-wise. Place the jelly roll pan in the oven on the middle rack. Cook for about 10 to 12 minutes or until the bacon is cooked to your desired crispiness. It should lift off of the cooling rack easily. Make sure you position the bacon in the middle of the oven. If it is placed too close to the top of the oven, the bacon will burn. If it is placed too close to the bottom it will not cook thoroughly.